Last time not worn: 1996, but only because it is retired. In what can only be described as a blowout, Red made it hard on the competition at #2. It took me longer trying to come up with a couple of names to add than it did anything else! There are outstanding accomplishments surrounding Schoendienst no matter which way you choose to look. His playing career began with the Cardinals contending for World Series titles, and it ended just as the amazing run was beginning in the 1960’s. And for the better part of two decades, St. Louis had Red winning from the dugout. Opening Day under the Arch will always be special, but it is just that much better with Schoendienst bridging the gap between generations. 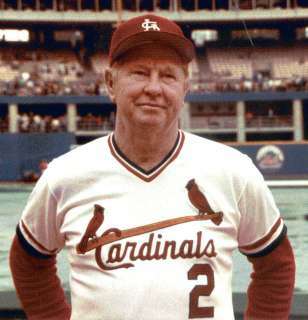 He not only has been apart of the organization off and on for 70 years but was the go-to Cardinal whenever a manager was needed. There is just something magical about #2, and he was surely missed in Florida this Spring. I’m left in awe when looking at not only his combined playing and managerial stats, but the fact that he made the seamless transition from one career to the next during one of the most important eras in St. Louis history. Just being able to pick his brain has to be something Matheny used many times in recent years, and I can not think of a better Cardinal to take us one step closer to Sunday. Red is the Birds on the Bat to me, but he also means so much more to the community that cherishes those who give back. Red and Stan passed the torch to Gibby and then tomorrow’s number carried on the tradition. We are fortunate to have these living legends around to honor, and I hope Schoendienst is around for many more!